Jesus freak Hideout (John DiBiase): So you've been doing well? Dan Castady: Yeah, this is the first time I've done GMA Week. JFH (John): Really? You didn't do it when you did your first record? Dan: We were just never around at the right time. It kind of doesn't make sense for me to come to GMA Week a year after our album came out. Tooth & Nail Records invited me this year, and I was free, so I was like "Yeah, I'll come!" JFH (John): So you guys are working on the Stargazer EP? JFH (John): It's not a label thing? Dan: Well, I mean, it's gonna be funneled through Tooth & Nail, but it's only digital. I don't know what our label really does. *laughs* They're not giving us a budget so we're just recording it at home. JFH (John): So when did you decide to record an EP? Dan: We've always liked the idea of doing something that's just an experiment. When you're doing an album, it feels like the stakes are so high and you're in the studio and every song has to be polished. If it's not perfect, your career could end or whatever… *laughs* The basic story of how this started is when we did this thing in Europe with Plain White T's and Tooth & Nail was like "Ok, we'll give you some tour support, but we don't really have a story over there, so why don't you guys do an EP to pay for your tour support and we'll just release it on iTunes." We said "yes" because we want to get content out there. The days of a band going and touring on an album for two years are long gone. I think if we're writing the songs, then why not get them out there however we can whether it's a digital release or a CD. We had a song on the last album [Secrets Keep You Sick] called "Faster Still," and it was definitely different from the rest of the album. We liked that, so we thought if we were going to experiment, that was the arena to do it in. We want to take risks. Not every song is gonna have a form. (Amy DiBiase: "Faster Still" is my favorite song). Thank you! We're doing a remix of that song. It's kind of the core of the EP. It's gonna be crazy, techno-obnoxious. But we can do those things and just have fun with it, and like I said, it's an experiment. JFH (John): What's the rest of the EP gonna sound like? Dan: Very much in that same vein. We're kind of using the remix as a model. They're all brand new songs except for that one. There are 5 or 6 songs on it. JFH (John): Where'd you come up with the title? Dan: We were playing around with words that meant other worldly, weird, electronic…things like that. Then stargazer came up, so a lot of the lyrics talk about the galaxy and the stars and stuff, so that's why we named it Stargazer EP. I think it kind of fits with the spirit of it too. It's just like being free, hanging out, and looking at the stars. JFH (Amy): Where did you get the idea musically for the interlude in "Faster Still"? Dan: Oh! Are you talking about the little piece after the song? That was something that I was writing, and we were trying to be clever with the sequencing. It's actually part of "Closer," but everyone tells me "The end of 'Faster Still' is so beautiful." I always thought they meant the part "Covered in love/ In our love/ It's getting faster everyday." I was always like "Really?" *laughs* I realized what they're really talking about like six months after the album was out. JFH (Amy): It's on "Faster Still" though. Dan: Yeah, it's on "Faster Still," but I think it's kind of a prelude to "Closer." I just kind of had some chords and lyrics. It's about my mom. I know Kanye West had a similar experience when his mom died. It's like you have these dreams that are so real, and you just feel that it is real…real in your head. I don't know if my mom was letting us know that things were OK and that she was with God, but I was having these super vivid dreams. That song was me putting those feelings out there. I think people who've been through that can totally tap into that. JFH (Amy): I always listen to those two songs together and how they just flow into each other and how they're like a marriage to each other. They're very complimentary of each other. Dan: That's cool. I think of it so much lyrically as a part of "Closer" because it's a song about my dad and my mom. That's good that that works! I always like it when albums flow. JFH (John): Are you guys thinking about your next record yet? Dan: Yeah. The tour with Plain White T's thing kind of threw us off, but in a good way. We were already writing for the full-length, and I was hoping we'd be in the studio for it by May or June. A lot of the times when we write, I'll write twelve songs that I think are great and the other guys will come to the table later in the game. Talking to them, they felt like we had six songs and I felt like we had twelve, so I think now it'll probably be July or August when we get in the studio…something like that. And we definitely want to use the same producers because they're like our best friends. The guys who produced Secrets Keep You Sick are so cool. JFH (Amy): Going back to "Faster Still," who inspired that song? I was wondering if it was a childhood friend or a fictitious person because it seems like such a deep story. Dan: That song and the last song on the CD, "Revisited," those are both about my cousin. I wrote a lot of songs about him kind of before This Too Shall Pass. We had an EP. He was the first person I lost in my life. I don't know why, but I tend to gravitate towards these deeply rooted feelings in my life. "Revisited" is like the dark side of losing him because he was my cousin and best friend at the time. Through that experience, I think that's how God got my attention. I saw how quick life could end. So with "Faster Still," I just wanted to write a song about the good times and us growing up and the stupid stuff we did like dine-and-ditch at a Denny's when we knew the people that were working there. That's the line about the police phoning my house. *laughs* Like, what were we thinking? So yeah, that's about my cousin, Andrew. Dan: *laughs* Oh yeah. It's weird. I grab from all sorts of areas. I like MxPx so much because they remind me of my favorite band growing up, which was Face to Face, a California band. MxPx, and I'm not saying this in a mean way, is almost like a child to Face to Face. Even though they were around at the same time, it seemed like that style of music. So being on tour with MxPx was kind of like being on tour with Face to Face. I think our energy comes from growing up listening to that band. We want to have that fast rock thing going on. But lyrically, probably the stuff that Jeremy Enigk did over the years with Sunny Day Real Estate. I love the poeticism of his lyrics, how he puts things, and how he can talk about his faith but do it in a beautiful, relevant way. A lot of his stuff is so out there that it's hard to figure out what he's talking about, but at the same time he can sing about what he wants to sing about. He's not put in a box. JFH (Amy): I also think just poetically speaking, your lyrics speak for themselves aside from the music. If for whatever reason you're unable to listen to the music and can just read what you're saying, it just can stand alone versus some songs that are just thrown together that without the song giving it backbone, they're just words that don't mean anything at all. I think every one of your songs is like a story. It kind of reminds me in some ways of a really hard, cutting-edge version of folk with a story. It has so much backbone that it just can stand alone. Dan: That's amazing. (Amy: That's when you know it's deep). My dad's favorite guy my whole life was Bob Dylan. My dad said all my life "If you're singing a song, why would you sing a song if you don't know what you're saying?" I definitely have strived to do that but it's really cool to hear that. JFH (John): Do you have any fall tour plans? Dan: The plan is to have Stargazer EP come out right when we do a west cost/Midwest run with Showbread and Ever Stays Red. It should be interesting. JFH (John): Yeah, that should be interesting, because Ever Stays Red is nothing like Showbread. They're a lot more mellow compared to Showbread. That would be very interesting to see that kind of mix. That reminds me of the recent Superchick tour that started out with a newer band that was pop/rock and then it went to Britt Nicole which is power pop, then they had KJ-52 which is hip-hop, and then they had Disciple. I bet some of these more diverse tours are trying to pull from more audiences instead of just the rock kids, you'll have some pop/rock kids that will come out for Ever Stays Red. Dan: We don't do many tours that play at churches. It is pretty cool to see the common ground is our faith and you know that. I mean, I can't assume that I know what anyone's about, but you know that you have that in common with people at the show. I think that helps bridge the gap a lot. JFH (John): I think so too. There's definitely a whole different experience going to a Christian show compared to a mainstream show with just the audience. You can feel the difference between going to a club and going to a church. It's like night and day. I never realized it until I saw an Anberlin tour at a club, and then the next day, we saw Disciple's tour at a high school. I don't remember exactly, because there were like three shows in a row, but one of them was a Christian event and had a completely different atmosphere. Even the people that work at the venue are completely different. If you go to a bar or a club, you'll be lucky to get anybody that's nice to you that work there. It's like two different worlds. Dan: Yeah, we talked about that a lot with Sherwood. They feel guilty playing at churches sometimes because it just feels like you're putting a label on what you're doing in exchange for pampering. I don't know, that's how they feel. They say "We're not a Christian band, we're Christian bandits." *laughs* They feel like they're stealing from Christians and they didn't like that, so that's what they're saying. They are Christians, so it's just one of those things. Copeland has that same issue, I think. They just don't want to put God's name on what they're doing because they feel like they'd be doing it to tap into a market that they're not comfortable tapping into. JFH (John): Well I guess it's all in the heart too. If they know they're doing it for the right reasons, then it's between them and God I guess. Dan: The way I feel is that you're writing songs that you want to write and it is from your heart so if somebody identifies with that, then I want to play for them. I don't care if it's at the Vans Warped Tour or if it's at Lifeway Christian Stores. 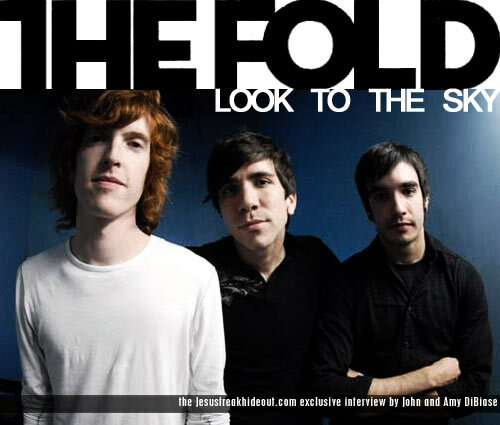 The Fold's Stargazer EP hits iTunes August 26th!